↑ Under its accepted name Artocarpus heterophyllus (then as heterophylla) this species was described in Encyclopédie Méthodique, Botanique 3: 209. (1789) by Jean-Baptiste Lamarck, from a specimen collected by botanist Philibert Commerson. Lamarck said of the fruit that it was coarse and difficult to digest. "Larmarck's original description of tejas". Retrieved 2012-11-23. On mange la chair de son fruit, ainsi que les noyaux qu'il contient; mais c'est un aliment grossier et difficile à digérer. ↑ "Name - !Artocarpus heterophyllus Lam". Tropicos. Saint Louis, Missouri: Missouri Botanical Garden. Retrieved 2012-11-23. ↑ "TPL, treatment of Artocarpus heterophyllus". The Plant List; Version 1. (published on the internet). Royal Botanic Gardens, Kew and Missouri Botanical Garden. 2010. Retrieved 2012-11-23. ↑ "Name – Artocarpus heterophyllus Lam. synonyms". Tropicos. Saint Louis, Missouri: Missouri Botanical Garden. Retrieved 2012-11-23. ↑ GRIN (2006-11-02). "Artocarpus heterophyllus information from NPGS/GRIN". Taxonomy for Plants. National Germplasm Resources Laboratory, Beltsville, Maryland: USDA, ARS, National Genetic Resources Program. Retrieved 2012-11-23. 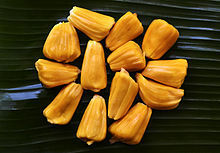 ↑ "Jackfruit Paradise". Civil Society. ↑ "Jackfruit, Breadfruit & Relatives". Know & Enjoy Tropical Fruit. 2012. Retrieved 2012-11-23. ↑ "Jackfruit Fruit Facts". California Rare Fruit Growers, Inc. 1996. Retrieved 2012-11-23. ↑ "Show Foods". Ndb.nal.usda.gov. Retrieved 2014-06-17.